We specialize in development and implementation of custom websites using the WordPress Content Management System – including themes, plugins, and the additions needed to set your site apart. Whether a custom theme that reflects your aesthetic, a custom plugin that adds functionality that presently doesn’t exist, or combining a number of existing elements into a comprehensive, integrated solution that provides exactly what you need – we have the skills and experience to make your project a success. We can work with your graphics designer or use a member of our team for spectacular results. 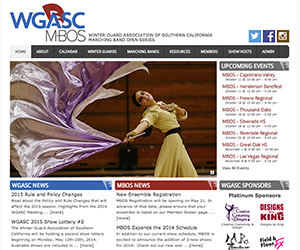 Winter Guard Assoc of Southern California is the country’s largest winter guard circuit with over 350 member organizations. In addition their Marching Band Open Series circuit supports over 75 participating High School bands in SoCal and Nevada. We are in the process of developing a custom MULTI-CIRCUIT version of MAST for them, which will allow them to manage both circuits with a single system – leveraging common judges and other resources. The core site went live in early May 2014 and the MBOS circuit will be in full production for the Fall 2014 season. 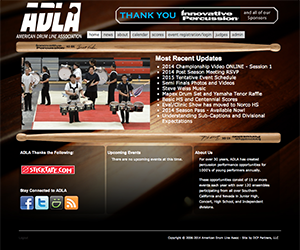 American Drumline Association was looking for a complete overhaul of their web presence and a new system to manage their circuit. The result was a new site built on the MAST platform for a custom solution. Ensemble registration, event scheduling, judge scheduling, iPad-based scores entry, event management, and scores reporting provided all of the tools they need to run a successful season of indoor drumline competitions. 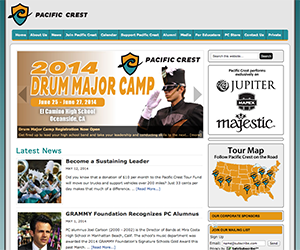 Pacific Crest is Southern California’s World Class DCI drum corps and as-such has a huge base of members, donors, volunteers, alumni, and fans to keep updated with the latest information. After successfully migrating the organization from a Joomla environment to WordPress, we set about creating custom features on the site to provide things like an alumni database, data-driven map of the corps’ tour (with performance venue details), and custom registration forms with integration to Salesforce.com. In addition to the WordPress system, we have implemented a custom online Ticketing system and ZenCart store for the organization. 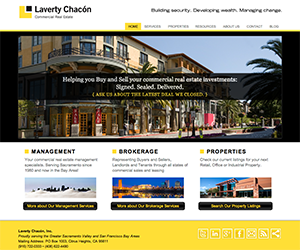 Laverty Chacon’s commercial real estate business needed a vibrant site that set them apart from the rest of the market – as well as one that provided them and their upscale clients with the means to organize, present, and locate the properties in their portfolio. We used the Genesis Framework as the foundation, then applied a highly-customized theme to give them the look they wanted. Then we developed a set of custom plugins and tools to organize and search their listings. 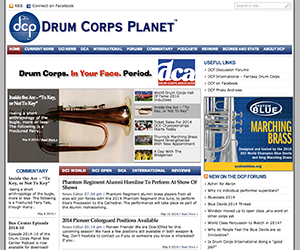 Drum Corps Planet is the world’s largest online community for the drum and bugle corps activity and one of our own internet properties. Originally a Joomla site, we migrated the entire news site (with thousands of articles) to WordPress to take advantage of the features and flexibility it provides. In addition to the content, the site features a custom scores reporting and analysis system, custom layouts for contributing columnists, an advertising banner administration and delivery sub-system, and integrations to other sites. We would love to put our experience in these projects and many others to work for you.